This case study showcases my ability think critically about a product’s use case and how product adoption and user engagement could be increased. There was no user research involved, and the design decisions were based on my designer’s intuition and knowledge of human psychology. People are usually influenced to purchase a product or service based on positive reviews. However, there are those who are skeptical about the reviews online. Hence, why RatedByFriends was conceptualized by our client, who wanted to create a social media platform of trusted reviews. RatedByFriends was previously designed and built by another agency, but our client was unhappy with their results. So, my team and I were tasked to help redesign the visuals and experience of the product across the iOS and Android platforms. Since this was to be a 7 business day project, we were unable to perform any user research or usability tests to gather the data we need. I worked alongside 2 UX Designers and 2 visual designers. I was responsible for restructuring the information architecture, improving the product’s use case, wireframing hi-fidelity mobile iOS & Android mockups, and managing the team’s design files for mobile iOS X. In order for us to visually redesign the product, we needed to understand how the app was structured and functioned. This would allow us to make design decisions that was based on a better rationale—since we did not have any user data to work with. We worked with the design screens from the previous agency. It was difficult to understand the product by looking through each design screen, so we created an overview of the app’s structure by drawing out its sitemap on a whiteboard. 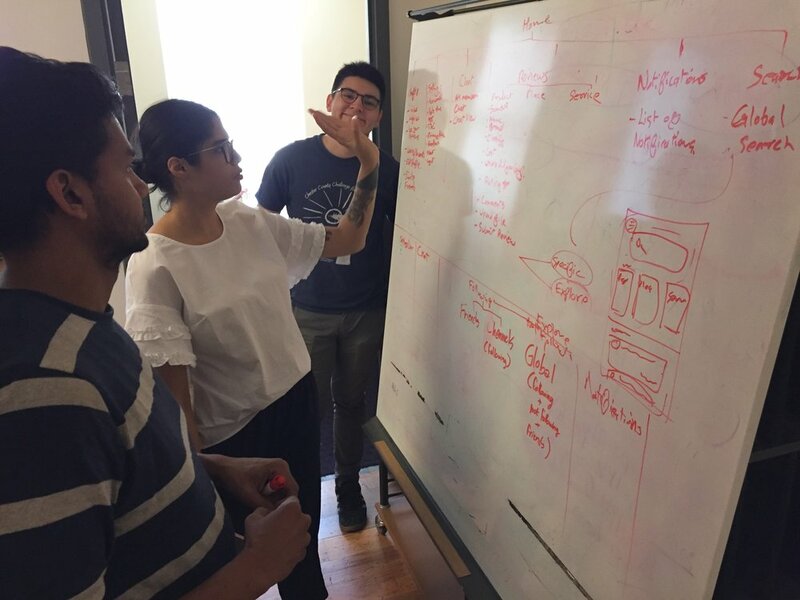 From here, we evaluated every screen, and tried to understand what users could do based on the UI components and the connections between each screen. A session where we evaluated the app and its features. Based on our evaluation, we understood the capabilities of the app and what users can do. Essentially, it was an app that let’s users review and read a product, service and business reviews, and follow and communicate with each other. This led us to conclude there were not enough valuable use cases to keep users interested. There are 2 different users on the app, and each are very dependent on each other to keep the platform’s community alive. Look for reviews to see if they should invest their time and money into a product, service or business. What are the chances that the reader will find the review that they are looking for? As this was very unlikely, we believed the app could not provide the users enough value for them to keep the app at its current state. Also, we rationalized, without the reader, there won’t be enough motivation to keep reviewers to keep creating content. So, we made it our mission to figure out a way to remedy this issue. After we understood the functionality of the app, we began analyzing the designs to see what improvements were needed. How might we design a system to motivate users to adopt the platform while coming up with a refreshed design that will satisfy both iOS and Android design guidelines? This question led us into the realm of human psychology and the concept of how humans are more likely to repeat past behavior based on the rewards they received. The rewards we implemented were social, business and gamification rewards. In this system, we leveraged rewards to condition users to form a habit of engagement with the app. The following sample is how the previous designs looked. To read more case studies, check out the links in the footer below!